PIQUA — One of the 2018 goals of the Mainstreet Piqua Beautification committee was to complete their first mural project and that goal has been accomplished with excellent results. The Johnston Farm mural had been a dominant feature of downtown Piqua since the late 1970s, but has now been replaced with a new mural depicting parts of Piqua’s early history. The mural was done by acclaimed muralist Eric Henn. Henn lives in Franklin, but travels throughout the country and internationally to do murals on water towers, buildings and interior projects. 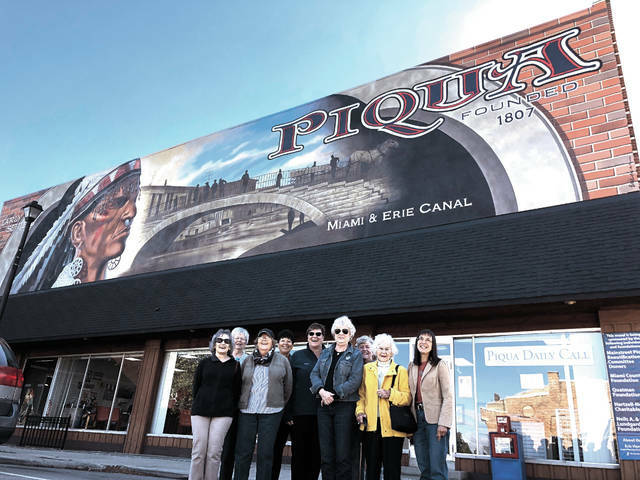 Henn collaborated with the beautification committee to make sure the mural would not only represent the Piqua community but would also be culturally sensitive as well as timeless. Ruth A. Koon chairs the Mainstreet Piqua beautification committee. “We are excited by this project and believe that this mural will be the first of many in our community,” Koon said. Other members of the Mainstreet Piqua Beautification Committee include Rita Enderle, Jean Franz, Judy Quinter, Ann Comer, Kathy Kiefer, Marsha Koon, Elaine Sullenberger and Ruth Cameron. The mural was paid for entirely by grants and private donations from individuals and businesses throughout the Piqua Community. Grants for the project were received from the Hartzell-Norris Charitable Trust, Neils A. & Ruth Lundgard Foundation, the Quatman Foundation and the Miami County Foundation. Mainstreet Piqua is currently in the process of reviewing other sites in the downtown area that could be used for another mural. In addition to the mural project, the beautification committee is responsible for the downtown planter program which includes the summer flowers and the mums that were planted in early fall.